This month's Common Thread Give-Away Artist is Veronica Hallissey. I am only too happy to tell my readers more about Veronica. I have been so privileged to get to know her better this past year. She is truly a kindred spirit and is quickly becoming a good friend. 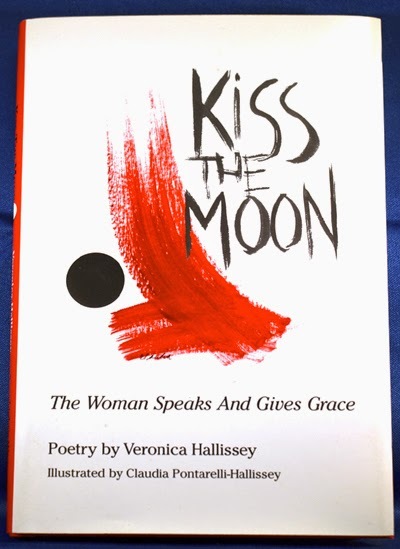 This month Veronica is giving away her book, Kiss the Moon, an anthology of her best poetry. To register to win all you need to do is go to her website and leave a comment for her Monday to Thursday. Be sure to leave enough information about yourself that she can find you if you should become the winner of her drawing to be held at the end of the week. This is a most generous gift and one that I can speak of personally. At the time that Veronica sent me her book, Kiss the Moon, I was in the middle of a true crime book marathon, not to be disrupted, or so I thought, but when the murderer decided to save his victim's foot in his freezer as a keepsake, I knew it was time to move onto a less chilling book. As soon as I started reading her Kiss the Moon I couldn’t put it down!! It is better than any true crime book to be sure!!!! It was like getting an infusion of life poured right into my soul! I loved it and have picked it up and reread it many times since and have never returned to find out who discovered this poor woman's foot in the freezer! Unlike my own writing, Veronica has a way of picking her words so carefully that it is much like looking at a special painting that captures thoughts and feelings and pulls you right into the special moment in this artist's life, forming a special connection that makes you realize that there is a bond between us all, except perhaps, for cold blooded killers! They likely couldn't relate to Veronica's beautiful writings! Kiss the Moon begins with a preface of Veronica's humble testimony about knowing of a special Presence in her life. There is no doubt that she has a special connection with her creator that flows through her. Her ability to see the world with such clarity of vision and then express it with such precision and conciseness is truly an art form that is uncommon in today's world. Her poems are epic as they tenderly speak of love and of all of the seasons of a person's life. I loved her poem about the woman taking her dear friend, her cow to be sacrificed to feed her children after supplying them with milk for so many years. Her love and appreciation for her cow is palpable. Another favorite of mine was one about eating dinner while watching the news and her husband declining desert saying that he was experiencing a bit of indigestion that must have been caused by something he ate. Veronica's subtle humor comes forth as it wasn't the dinner but the ingestion of such a horrible stream of news events that would be enough to sicken anyone! It made me laugh as to how obtuse our thinking really can be! Her daughter-in-law's artwork sprinkled through the book is equal to the beauty of Veronica's poetry. For the sake of brevity in my blog I will leave yet other favorites for the subject of blogs to come, and spare my readers of my ramblings, though Veronica's writings have inspired me to open up my journal with renewed interest and try to better capture the memoirs of my own life. Her poems have touched my heart and made me realize that I am still very much alive, no matter how inundated I can be with life's pressures. Her keen awareness of all that life teaches us makes me realize that all of my life's events are full of blessings that I am sometimes too blind to see. Isn't that the purpose of good art, to open us up and make us appreciate the richness of our own life? Veronica's writings are indeed a very special gift that she shares with the world! Don't miss visiting her website at http://fromanupperfloor.com for samples of her work, and do treat yourself to her books and read what she herself considers to be the best of her work! They will feed your soul! Thank you Veronica for nourishing mine!